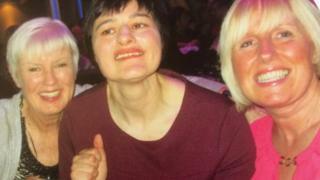 Life began at 40 for severely learning-disabled Colleen say her sisters, when she moved into her own home. She is living happily in her Coventry house, 11 years after leaving unsuitable residential care, thanks to a carefully-crafted network of 24-hour care and a range of state benefits. But due to the impending removal of the housing part of her support, known as Support for Mortgage Interest (SMI), that security has been mired in uncertainty and anxiety. Colleen is one of 124,000 households in England who receive this particular benefit. It helps them repay the interest on their mortgages and nearly half the recipients are pensioners. However, within weeks the benefit will be axed and a loan offered instead. Those who have not signed up to the new government scheme face losing their mortgage support. Though small, the current funding arrangement makes enough difference to enable Colleen to live on her own, and not in a care home. With no capacity to make her own decisions, her sisters, Felicity Banbury and Fiona Garrigan, look after her interests. They fought hard for 13 years to find her somewhere comfortable, safe and suitable to live. Felicity says the impending changes put that security at risk. “The biggest worry was that we have been given six weeks to make what are really serious financial decisions affecting Colleen’s future,” she said. A lack of timely communication about the new rules, by the Department for Work and Pensions (DWP), has stoked up fears of arrears, and ultimately evictions, for some vulnerable and elderly people who receive SMI. By late January fewer than 7,000 of the 124,000 affected households had signed up for the new loan scheme. And the latest statistics from the government reveal that 5,500 people have still not been contacted about the options ahead. With just four weeks to go until the current benefit is withdrawn, neither Colleen nor her sisters have received the full information they need from the DWP (via private firm Serco) to be able to make a judgement on the options ahead. In fact they were contacted for the first time about the forthcoming changes only three weeks ago. This should give the most vulnerable SMI recipients – those with someone appointed to act for them – extra time to make their decision. A DWP spokesperson said: “Over time, someone’s house is likely to increase in value, so it’s reasonable that anyone who has received financial help towards their mortgage should be asked to pay that back if there is available equity when the property is sold. “We have been contacting people to explain the change and signpost them to independent advice giving them plenty of time to make a decision. “But we understand that there are vulnerable people including those with severe learning disabilities or dementia, many of whom have someone acting on their behalf, who need extra support and time,” said the DWP spokesperson. The DWP also said anyone who had not yet been contacted about the changes would now remain on SMI until they had been reached and guided through the options. Mrs Barleon from Mencap said this was not the end of her concerns. “The worry is now that innovative schemes such as homeownership for disabled people, will no longer be available in the future,” she said. Before moving into her own home, Colleen spent 26 years in residential care, which her sisters say did not meet her needs. “When she was part of statutory services, she lived with others and we saw a deterioration in her condition,” said Felicity. Felicity welcomed the late decision to give the most vulnerable SMI recipients more time to consider their options. But she said she was still very concerned about those without the sort of support she offers to Colleen, and possibly without a voice to argue their case.